Traditional Malaysian games hark back to a time when life was simple, during an age when modern-day, much coveted gizmos like computers, smartphones, video games et al didn’t exist. Traditional games however, continue to be played by children in Malaysia’s many kampungs (villages)though adults usually participate in these games during festive occasions like weddings or for celebrations during the rice harvest season. These traditional games tend to foster a sense of community and spirit and feature significantly in the cultural heritage of Malaysia. A Wau is a traditional kite which is often home-made. Kite flying has been popular in Malaysia for centuries. Malaysian Wau exist in various shapes and sizes and it is not unusual to find a fish, bird or frog-shaped Wau, though the most popular Wau seems to be the Wau Bulan or moon kite, named after its curved, crescent-shaped tail. Kite flying is especially popular in the Eastern Malaysian state of Kelantan. 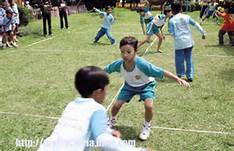 Sepak Takraw is a traditional ball game played all over South East Asia. This ball game, which is also known as Sepak Raga, is often said to be a combination of soccer, martial arts, volleyball and gymnastics. The moniker for the game is believed to have evolved from the Indonesian term for kick (Sepak) and the Thai term for woven ball (takraw). The term Sepak Takraw literally translates as ‘kick ball’ and that is exactly what the game is about. The game tests the skills and dexterity of the players as it requires them to use their feet, chest and head to pass the ball for they are not allowed to use their hands or lower arms to make a pass. 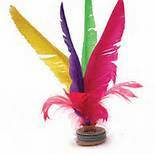 A Gasing is a term used to describe a giant spinning top that can weigh as much as 5kg (10lbs). The top is sent spinning by unwinding the cord that has been wound around it. It has then got to be scooped off the ground while it is still spinning by using a wooden bat with a slit in it and transferred on to a low post with a metal receptacle. A game of gasing requires much skill, strength, dexterity and co-ordination. Gasing is often played during the rice harvest season. Traditionally played by women in Malaysia, and various other parts of the world, Congkak is a game which features the use of much logic, strategy and mathematical calculations. The most rudimentary form of the game of Congkak once featured holes dug into the earth and tamarind seeds as counters. Today, the game is usually played with a wooden Congkak board which has two rows of five, seven or nine holes carved into it along with two larger holes at both ends called ‘houses’. Moreover, players now use cowrie shells, pebbles and marbles as counters instead of tamarind seeds for a game of Congkak. Teng Teng is a traditional Malaysian game that is quite similar to the English game of ‘Hopscotch’. Usually played by young girls, Teng Teng, which is also known as Keinting requires a small flat stone and flat surface on which the grid for the game is drawn. Two or more players are usually required for a game of Teng Teng. This traditional game hails from Sabah where it is played by the men of Bajau and Iranum tribes. The players form a circle as they face each other and attempt to strike a floral carrier called ‘bunga manggis’ suspended from a ten meter tall pole. The winner is then awarded with the various ‘goodies’ (money, gifts and sweets) stored in the carrier. This act of breaking the floral carrier is in fact quite similar to the breaking of the ‘matki’ during the Indian festival ‘ Jamnashtami’. This is yet another outdoor game played by two teams. No equipment is required for the game. However, the two teams should be made up of at least four people. Galah Panjang is played on a flat surface like a badminton court or tennis court for it needs to be played on a terrain which has a large rectangle with six quadrants drawn on it. Before the game can start the two teams toss to determine who will attack and ‘defend . The attackers then launch an attack individually or in a group, as they try to tag the defenders by running past the first line of defense and then getting back without any physical contact with a member of the opposing team. If a player does happen to touch a member of the opposing team that player is considered ‘dead’ and has to leave the field. Batu Seremban/ Batu Serembat, is the Malaysian version of popular traditional game of five stones. The game usually features two players who throw five stones in the air by turn and then try and catch as many as possible on the back of the same hand, The game continues depending if a player has managed to bag a stone or not. Capteh is a Chinese traditional game and features a shuttlecock adorned with feathers. The main idea of the game is to keep the shuttlecock in the air for as long as possible by kicking it. The winner is the player who achieves the maximum number of kicks.